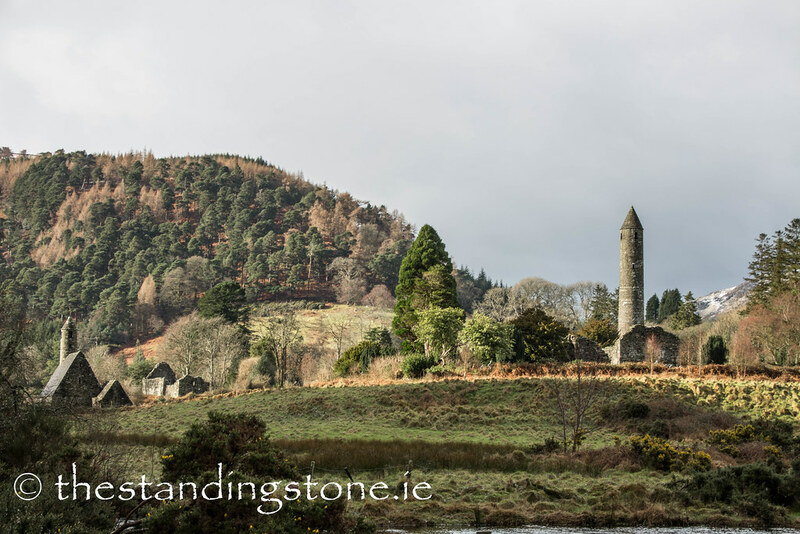 The Standing Stone: Glendalough, Monastic City, Co. Wicklow. Location – Nestled in the Wicklow mountains on the R756. I would recommend a Sat-Nav for this one. Description and History – Glendalough is one of Ireland’s most famous and important early-Christian sites, if not the most famous and important. It was founded in the 6th century by St. Kevin and went on to become a flourishing monastic city. Little is known about St. Kevin, as with many early-Christian Irish saints, and what we do know comes from sources written centuries after his life. Therefore, what we can claim to “know” is largely myth so take everything with a large pinch of salt. He was supposedly born in 498AD as Coemgen (Irish for Kevin) and was the son of Coemlog and Coemell of Leinster and of noble birth. He was baptised by St. Cronin of Roscrea, who also founded an important ecclesiastical site. Following his ordination he travelled to Glendalough to live as a hermit which he did so by sleeping in a man-made cave. This cave, St. Kevin’s bed, is still in existence although largely inaccessible due to it being built into a cliff face. Over time he gained a reputation as a wise teacher and attracted several followers – Glendalough grew as a monastery from this. Following years of pilgrimage he returned to Glendalough to preside over it until his death in 618AD aged 120. Following Kevin’s death the monastic city flourished well into the medieval period and is mentioned many times in the various Irish Annals. In 1111AD Glendalough become one of two dioceses of North Leinster. The book of Glendalough, now housed in Oxford, was written here around 1131AD. Glendalough was plundered in 1176. In the 13th century the importance of Glendalough diminished after the diocese of Glendalough and Dublin were merged. The site was ruined in 1214 by the Normans and further destroyed in 1398 by English forces. It remained a site of pilgrimage. Most of the present remains date from the 10th to the 12th centuries. Difficulty – Most of Glendalough is easy to find and walk around. It is a popular tourist attraction so there is a carpark and facilities on site and a visitor’s centre. Some of the bullaun stones are located in private land and can be tricky to find. For more sites in Co. Wicklow, click here.